Stop by SDK and pick up these great new products now available in Ellen's shop! Boy's Rule is a fun kit for that special little man in your life. This versatile kit of 12 papers and 52 elements including a baseball frame, truck, train, and more provides enough stuff to scrap years worth of memories! Are you seeing spots? Then you must be looking at Ellen's colorful new Goin Dottie kit! With 10 papers and 64 elements in red, hot pink, and black this kit makes the perfect addition to your collection and is sure to add a little pizzazz to any layout. Check out these great new kreations now available at SDK! Feltsation from Ellen includes 10 papers and 64 elements including stitched felt flowers, butterflies, beaded dragonflies and more! This kit in soft shades of lavendar, pink, green, yellow, and orange is perfect for all of your springtime layouts! Libelula Bracket Books by Lynn are the perfect addition to her already released Libelula kit. This set of 5 bracket pages and 4 plain pages for the front and back make a beautiful gift for you or a loved one. Sweet Dreams Brag Book by Kristi was created using her Sweet Dreams Kit. Great for a quick and easy brag book for yourself or to share with friends and family! Mother's Day is May 11th so be sure to pick up this beautiful new A Gift for Mom mini kit from Lorie. This kit comes with 5 papers and 12 elements perfect for creating a special layout of the kids or a nice greeting card full of love for Mom or Grandma. Need another Mother's Day kit? Look no further than Herald's Mother's Day Papers collection. This kit comes with 27 aged papers dedicated to Mom and is perfect for creating a wide variety of Mother's Day gifts or for use in heritage layouts. Golden Memories from Sue is a beautiful kit full of golden textures and elements with a splash of contrasting colors of red, blue, and green. This kit of 6 papers + a bonus paper and elements including hearts, feathers, and a dove is perfect for scrapping heritage, love, and anniversary layouts. Victorian Honeymoon is the third in a stunning series of kits by Kristi. 12 papers and elements including a Do Not Disturb sign, marriage licence, antique key, and more is perfect for showcasing your wedding and honeymoon layouts. 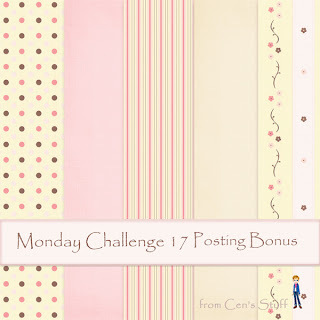 Head on over to Cen's blog and join in on this week's Monday Challenge. To qualify for the Posting Bonus you have to make a layout using only items from the freebie April Supa Digi Kit from Scrappin Digi Kreations. It still gives you lots to choose from as you have kits from Sue, Lorie, Herald, Kim and Cen all in different styles but with the same colour theme. You can mix and match if you want. The only part of the kit you can't use is Sammy's beautiful Quick Pages but snag them whilst your there, they are gorgeous!! You can only use items from the April Supa Digi Kit in your layout. It can be about any subject and you have to send a link to your layout or a copy to me at june.schutrups@btinternet.com by Monday, May 5th. That's it! Join in on the challenge and receive the following posting bonus free for participating. Be sure to stop by SDK and pick up Sue's addition to this month's Supa Digi Kit "Blooming Spring"
Don't forget to stop by our On the House section each week for new additions to this, and other, great monthly Supa Digi Kit freebies! Check out these great new additions to Lynn's SDK shop! Dirty Princess combines rich purples with bright whites and dark black to create this rockin' kit for girls. With an explosion of attitude and passion, this kit is perfect for that pampered princess in your life! Fairy Floss Bracket Books contains 5 bracket pages in .png format, and 4 plain pages for the front and back. There is also a bonus full size quick page included done at 3600x3600. Fits perfect in the Basic Grey Clipboard! A beautiful set to showcase your pictures. Lorie has created this beautiful quickpage set that coordinates with her Another Fun Day Kit! This set of 2 quickpages makes scrapping quick and easy. Each quickpage is also available separately! And if you haven't already done so, pick up the Another Fun Day Complete Kit too! This kit is perfect for a variety of layout themes and is suitable for both boys and girls! Add a lovely quote to your layouts with these wonderful new word art packs from Micha! WA Family 1 contains 8 beautiful family wordart quotes and 1 wordart frame. WA Family 2 contains 9 wordart quotes for Mom, Dad, Daughter, and Son. Perfect for adding a personal touch to any layout. Stop by Sue's SDK shop and check out these great new products! Formerly sold separately as paper and element packs, Sue has combined her two Sugarplum and Spices kits into a complete kit for your downloading convenience! An altogether scrumptious set of papers and elements in shades of deep purple and cream, this kit will add a super look to all your layouts...something for all! Boy Time is a kit with a masculine look and feel. 9 textured papers and elements of string, paint splats and drips, marbles, and more make this the perfect kit for the little man (or tomboy!) in your life! Stop by Kristi's shop at SDK and pick up her dreamy new Sweet Dreams kit. Sweet Dreams is a wonderful kit for the sleepy little angel in your life. This kit contains 12 papers, and many elements including 1 moon with 3 hanging star frames, 1 door hanger with enough space for a personal message, bows, glitter star doodles, and more! Be on the lookout for the matching brag book coming soon! Be sure to stop by Lynn's SDK shop and pick up her newest creations! Sparkled Gumdrop is a completely fun kit for the girl who loves to shine and be noticed. Bold brilliant colours mixed with the softer delicate side, this kit is sure to please. Don't forget to pick up the Sparkled Gumdrop Addon kit to complete the collection! 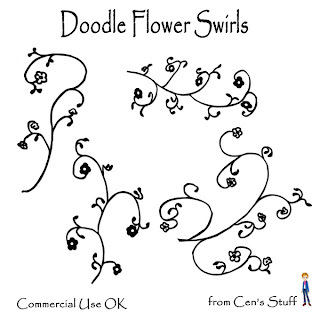 These beautiful floral doodles created in high resolution .png format make a lovely addition to any layout. Each set contains 5 doodles suitable for personal or commercial use. To Cen's Tuesday Chat at SDK!! Newbie, expert we need you!! Chat Times are Tusday 22 April 3.30pm EST (8.30pm GMT) 12.30pm PST. This weeks chat is following up on last week. Background Papers. No, it won't be the same as last week..this week is different and loads of fun!! Download the freebie overlays before the chat and get ready for the Great Paper Share. At the chat there will be tips on how to use the overlays and tutorial links for helping you make great papers. Plus lots of ideas and tips during the chat. Best of all, if you make 2-3 papers before Monday 28 April and send me a download link for them, I will package them all up and send everyone who takes part a link for the Paper Share. All levels of scrapper welcome so if you know a lot, come and share that knowledge or if your a newbie come learn some great stuff!! So drop by the Chat Room http://www.scrappindigikreations.com/chat/chatroom.php this Tuesday 22 April and join in, have some fun, learn some great stuff and get in on the Great Paper Share! Cen has freebie waiting for you on her blog. Be sure to stop by and pay her a little visit! Visit Herald's blog and pick up this fabulous freebie she has waiting for you! This collection is only available on her blog for a short time, so rush on over and pick it up today! And don't forget to leave a little thank you too! Impressionist paintings and warm French gardens, lavenders, pinks and blue are all there in this delightful new Monet's Garden kit from Cen. Soft and gentle, this kit lends itself to so many layout styles and photos. Ideal for Spring and Summer or just those dreamy moments. Lovely Lace for Commercial Use comes with 4 digital lace products for you to use in your commercial design or scrapping for hire. Each strip has been made at at least 4 times the size for best results when used in our products. Recolor them or use as-is as an embellish an element. It's just the right trim to finish off your latest kit! My First Transport Set Doodles For Commercial Use comes with a train engine, cart, carriage, caboose, car, and a truck plus on little toy person. Great for creating stamps, stickers or using as patterns for backgrounds in your digital kits for sale! Ideal for giving emphasis to your layouts . This set of nine different coloured brackets plus an exclaimation mark and three question marks are ready to pop onto your layout. This set of cute animal and insect doodles may be used as-is or can be colored or filled to suit your needs. May be used for personal or commercial use! This set of doodles comes with 4 brackets, 2 exclaimation marks, 1 notepaper, and 2 question marks. Use as-is or add some color or fill to coordinate with any layout! May be used for personal or commercial use. Looking for a unique way to add journaling to your layout? Then stop by Sammy's store and pick up this neat Journal Box Stamp kit! This set of 5 Journal Boxes comes in .png format and abr brushes and add a great finishing touch to your pages. May be used for personal or commercial use. Add a touch of summer color to your layouts with this new kit from Sue! Early Morning Glow Digital Kit comes with 10 richly textured colored papers and elements including daisy chains and frames in shades of green, yellow, and orange. Perfect for adding a little summer warmth to any layout. Two new portions of this months Supa Digi Kit Freebie "Blooming Spring" are now available in the "On The House" section at SDK! Be sure to stop by each week for another addition to this great collaborative kit! Stella has this great new sampler freebie waiting for you in her SDK shop! This Pink Blossoms Sampler comes with 3 textured papers and enough elements to make several beautiful springtime pages. And while you're there, be sure to check out all of the other wonderful products she has available! Stop by Lynn's shop at SDK and pick up this great ladybug brush set! This set of 4 ladybug brushes can be used for commercial or personal use. No credit is required. Made at high resolution, these little bugs will add a high quality addition to any layout and is compatible with both PS and PSP. Be sure to stop by Lorie's SDK shop and pick up her newest creation Another Fun Day! This kit contains 12 papers and 44 elements in shades that compliment both boys and girls. This kit is great for scrapping those everyday moments in your child's life! A combination of sea blue, pink, and brown makes Doreen's new Pink Parfait kit perfect for all your girly layouts. Pink Parfait Page Kit comes with 11 papers and 33 elements. Pink Parfait Quickpage Set comes with 4 - 12 x 12 quickpages that make scrapping a snap! Each kit is available complete or you may purchase items separately below. Click on any preview to be directed to that item in Doreen's shop!